On 30 July 2017, human rights defender and journalist Ko Swe Win was arrested at Yangon International Airport as he was trying to fly to Bangkok for a short work trip. He was reportedly taken into police custody in relation to a defamation case brought by a follower of extremist Buddhist monk U Wirathu, who told the police he believed Ko Swe Win was attempting to flee the country. Despite the defamation lawsuit filed against him, no travel restrictions were issued against Ko Swe Win. The human rights defender was released on bail on 31 July 2017. Ko Swe Win is a human rights defender and the chief editor of Myanmar Now news agency. From 1998 to 2005, he spent seven years in jail for distributing anti-junta material. He then worked as a senior reporter for the Irrawaddy Magazine and freelanced for international publications such as the New York Times. 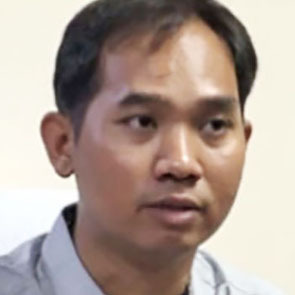 Ko Swe Win has written extensively on human rights cases that involve physical injury or death, unlawful detention or miscarriage of justice in Myanmar. In September 2016, he received the President’s Certificate of Honour from the Myanmar Ministry of Information for an investigative report he wrote exposing the abuse of two teenage maids by their employers in a Yangon tailor shop. On 30 July 2017, at about 7pm, Mingaladon Township police arrested Ko Swe Win at Yangon International Airport as he was traveling to Bangkok for work purposes. He was brought into police custody in Mandalay, where the defamation case had been registered against him in March 2017. He was detained after the plaintiff in his defamation case called the police to report Ko Swe Win allegedly planned to flee the country. However, no travel restrictions had been issued against the defender in connection with the defamation lawsuit. On 31 July 2017, a court in Mandalay Division’s Maha Aung Myay Township released Ko Swe Win on a bail of 5 million kyats (roughly 3 125 euros). The next hearing in the case is to be set on 7 August 2017. Ko Swe Win is being prosecuted for defamation under the controversial Article 66(d) of the Telecommunications Law, which carries a potential three-year prison term. On 7 March 2017, a follower of the nationalist group Ma Ba Tha filed a complaint against the human rights defender for allegedly defaming its former leader, Buddhist monk U Wirathu, in articles published online. He was charged at Maha Aung Myay Court, in Mandalay. I condemn the arrest and detention of human rights defender Ko Swe Win, as well as the defamation charges against him, which I believe are directly connected with his peaceful and legitimate work for human rights in Myanmar and the legitimate exercise of his right to freedom of expression. 3. Guarantee in all circumstances that all human rights defenders in Myanmar are able to carry out their legitimate human rights activities without fear of reprisals and free of all restrictions, including judicial harassment.